No one likes to be embarrassed by not giving a generous enough tip, but there are also times when some people aren't sure whether or not a tip is expected for a service. A simple thing to remember about tipping when visiting New York City, though, is that you should always tip your service workers. For New Yorkers who work in the service industry, including hotels, restaurants, and drivers, tips are an essential part of their earnings. However, you should also take into consideration the level of luxury at an establishment you visit as well as the quality of service delivered when you determine what kind of tip to leave your server. A lot of places in New York City only accept cash, or cash is their preferred payment. And even some places that accept credit cards still prefer tips in cash, so it helps to always have a few bills on you just in case. 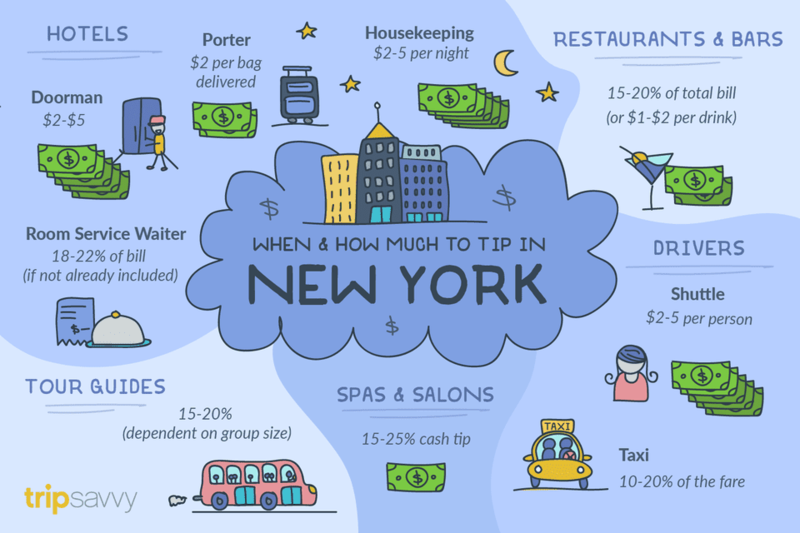 A handy way to calculate an adequate tip at most establishments is to double your tax amount on the bill—which accounts for an 8.875 percent sales tax in NYC and a 17 percent tip. It can often feel like everyone needs a tip when you're staying at an upscale hotel, and they, in fact, do rely on your tips to help them maintain their own lives in NYC when they're not serving you. Porters and bellhops should be tipped $1 or $2 per bag he or she helps deliver to or from your room. You should tip housekeeping between $2 and $5 dollars, depending on the services you're requesting. The hotel concierge, who manages all guests' requests, deserves a tip based on the service rendered—tip more for a particularly difficult request such as a hard-to-score dinner reservation at a nearby restaurant. For room service, you should tip your waiter between 18 and 22 percent of your total bill if it is not included in your bill. Most waitstaff and bartenders are paid very little and rely heavily on tips for their income. Check your bill to be sure that a restaurant (or bar) didn't automatically add a gratuity to your bill (this is particularly common when traveling with a group) as there's no need to double tip. Still, for the most part, you'll find yourself needing to know what the appropriate amount is to tip when going out on the town for food and drinks. For table service at a restaurant, make sure to tip between 15 and 25 percent of the total bill, depending on how good the service is. If, however, you're just heading to the bar or eating there, tip $1 to $2 dollars per drink or 15 to 25 percent of the total bill if you're putting it on a card. When you're going out to a fancy dinner, on the other hand, expect to tip 20 to 30 percent for dinner service and a few dollars for valet parking services. Coat checks and bathroom attendants at fancier establishments typically expect a dollar per item or visit, respectively. Like most other service providers, tour guides depend on tips. Generally, a 15 to 20 percent guideline applies, though tipping in these situations should also reflect the size of the tour group, as well as the length of the tour. Additionally, if the tour guide provides you a lot of personalized attention or gives you additional advice or assistance, your tip should reflect it. Small group tours with less than 15 participants should expect to tip $15 to $25 per person; medium groups with between 15 and 30 participants should tip around $10 per person; large groups with 30 or more participants should tip $5 each, and in all cases, the driver should be tipped between $5 and $10 dollars as well. Driving in New York City takes skill and know-how, and the people who drive you around New York City depend on your tips to pay their bills, which is why they put their expertise to the test each day to get you to your destination. Taxi drivers should be tipped 10 to 20 percent of their fare, which should be calculated automatically on the screen. Limousine and livery drivers, on the other hand, should be paid no less than 15 percent as their services are typically more deluxe. Shuttle drivers should be paid between $2 and $5 dollars per person being carried in the shuttle. For Uber and Lyft drivers, even though most of these apps already include the driver's pay in the bill for your trip, you can often approve an additional tip. Please consider tipping your app drivers more as these drivers are not paid the same amount as city cab drivers. At many spas and salons, even if they accept credit cards, they expect you to tip in cash, so keep this in mind when heading to your next appointment. Hairdressers expect between 15 and 25 percent tips on any treatments, with those taking over an hour deserving the larger tip. Tip the assistant who washes your hair, if applicable, between two and five dollars. Manicurists, ​masseuses, and aestheticians alike all expect between 15 and 20 percent of the bill as a tip.